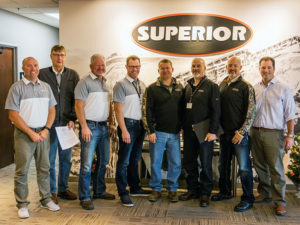 Morris, Minn. – Superior Industries, Inc., a U.S.-based manufacturer and global supplier of bulk material processing and handling systems, is expanding its partnership with longtime conveying equipment dealer, Power Equipment Company. In addition to conveyors and conveyor components, the Denver, Colorado-based dealer of heavy equipment for aggregates and construction will also represent Superior’s lines of crushing, screening and washing products in Missouri and Kansas. For the last couple of decades, the 82-year-old dealership has represented Superior’s conveyors in Colorado, New Mexico and the Southern two-thirds of Wyoming. That long-term relationship, says Superior, will continue flourishing in those states. Today, Power Equipment Company is also Superior’s full line dealer in Kansas and Missouri. A full line dealership sells and supports Superior’s complete product line from Rock Race to Load Out®, including crushing, screening, washing and conveying equipment. Based in Denver, Colorado, with eight additional locations throughout the Mountain West states, Power Equipment Company provides heavy equipment rental and sales solutions for owners and operators in the aggregate, construction, crane, and paving/compaction industries. The dealer is currently looking to add a ninth branch inside one of those states. From Rock Face to Load Out®, Superior Industries engineers and manufactures groundbreaking bulk material processing and handling equipment and cutting-edge components. From its headquarters in Morris, Minnesota, USA, the 45-year-old manufacturer supplies bulk crushing, screening, washing and conveying systems for industries like aggregates, mining, bulk terminals, agriculture, power and biomass. In addition to its home plant, Superior operates from additional facilities in Arizona, Georgia, Illinois, Michigan and Nebraska, USA; Alberta and New Brunswick, Canada; and three locations in Brazil to serve South American markets.